"Nothing makes you more successful than success!" Perhaps you know this saying. Behind it lies the interesting phenomenon that you are often more successful when you have just had success. Put simply, this is because of how our subconscious mind stores how success works; it repeats the same ways of thinking and behaving. With the same mechanics, some companies and teams manage to build successes on top of each other, while others have to fight again and again for every single success. The former have success systems, while others fight for anecdotal success. 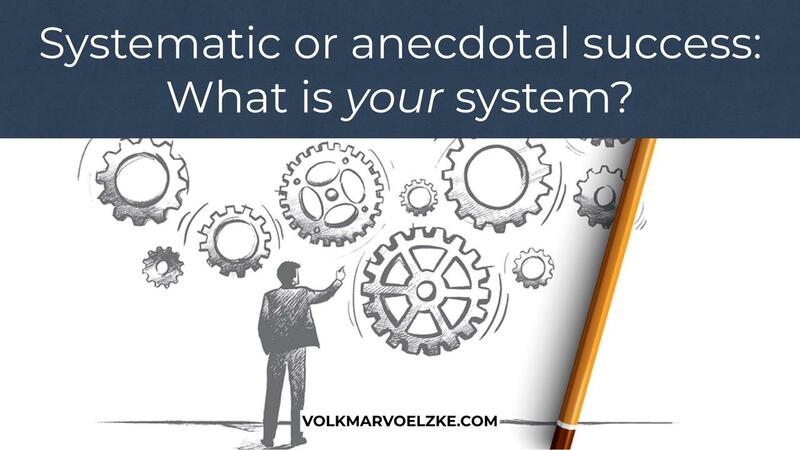 The big question now is: How do you get from anecdotal to systematic? I have just written an article about this for the business magazine Organisator (only in German; click here to request a copy). Strategy. In your strategy work, pay particular attention to your business model and your unique positioning in the market. Instead of "something more and so on", I miss a radical discussion about the innovation of the business model and a razor-sharp positioning in most companies. Sales. Do you have a sales force that systematically works the market and continuously generates added value for customers, which in turn is reflected in repeat business? For most sales teams, I see a more anecdotal fight for the next order. Tip: this change begins in the salesperson's mind. Culture. Systematic success always comes from the way people think and behave in the company. Strangely enough, however, there is hardly any systematic work being carried out on the mindset and the behaviour of the team members. This is exactly what is needed for sustainable success. One can, and must, train ways of thinking and behaving. All this can be trained systematically. Just let me know if you have any questions.